Thank you Veterans. | A.B.E. 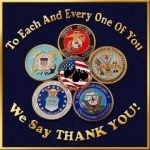 Remodeling, INC.
Today we honor Veterans of all ages, from all services. We appreciate what you have sacrified in your lives to serve this nation of ours. Thank you heros.